Bicycle advocates form a human-protected bike lane along the 1300 block of Pine Street shortly before the start of a public meeting on bicycle lanes, Wednesday, April 4, 2018. Changes are coming to the buffered bicycle lanes on Spruce and Pine streets, which rank among the most heavily used in Philadelphia. Nearly 1,000 bicyclists use those lanes each day, according to the Delaware River Regional Planning Commission. But safety concerns have been heightened since Emily Fredericks was struck and killed by a trash truck as she rode in the bike lane near 11th and Spruce streets last November. In a separate incident, another bicyclist was badly injured during a crash within the lanes. In response, city officials have proposed switching the bicycle lanes to the left side of Spruce and Pine streets between Front and 22nd streets. The lanes are currently located on the right side of the street. The proposed changes come as the city prepares to repave the streets. But the plan does not include protected bike lanes, a safety enhancement desired by many bicyclists in the city. 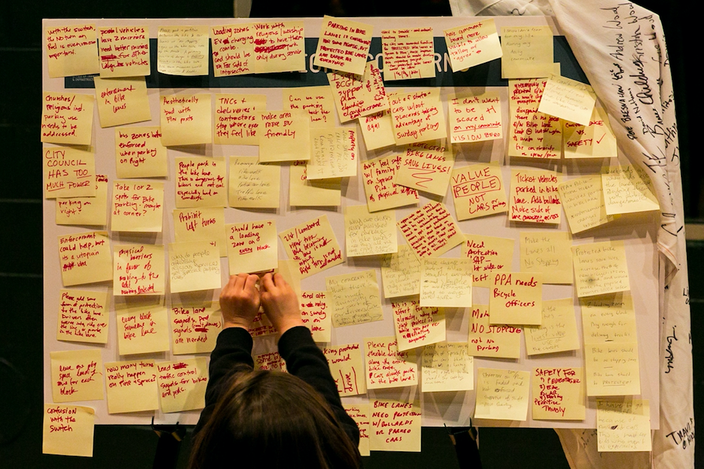 Dozens of people filed into the Kimmel Center on Wednesday night for the first of two public forums regarding the lane changes. The second will be held 6 p.m. Thursday in Gersham Hall at the University of the Arts. Kelley Yemen, Philadelphia's director of complete streets, said the left-side lanes will better protect bicyclists by placing them in better view of motorists. 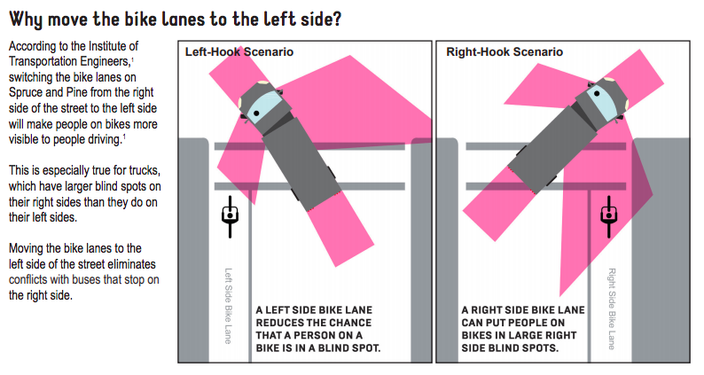 Drivers have smaller blind spots when bicyclists are riding on the left side. "We see large improvements by both getting bikes out of the way of SEPTA bus stops ... and we have better visibility, especially for larger vehicles, like delivery trucks and garbage trucks, because the driver is on the left-hand side," Yemen said. "For an average vehicle, the blind spot on the left is less than on the right. So, it will improve safety at the intersections, where we see most crashes. If a car is turning, they can see better if a bike lane is on the left than on the right." Moving bicycle lanes to the left side of the street will decrease blind spots and enhance biker safety, according to city officials. As part of the change, parking and loading zones will be moved from the left side of the street to the right side. Some residents have expressed concerns that they will have to exit their vehicles into moving traffic, but Yemen said that is no different than any two-way street. Both Spruce and Pine streets are one-way thoroughfares. Additionally, the plan calls for three potential improvements at intersections along the routes. "Some intersections are going to be higher volume," Yemen said. "Others are going to run into Rittenhouse Square and don't have a lot of turning volume. So, as we develop these plans, you'll see all three of these options in different locations." The first concept forces bicyclists and motorists to share a left-hand turning lane. Bicyclists will be separated from motorists by a series of delineator posts as they approach the intersection. But then the two lanes will merge into one turning lane. The second concept maintains the bicycle lane completely through the intersection, providing bicyclists with their own left-hand turning lane separated by delineator posts. But due to the parking lane, it does not give motorists space to pass drivers waiting to turn, potentially creating congestion. The third concept creates separate turning lanes for both drivers and motorists, but does so at the expense of a parking lane. As motorists approach the intersection, they shift around a turning lane if they wish to travel straight through the intersection. The city intends to repave the streets sometime this fall. In preparing the changes, city officials are meeting with businesses and residents on each block to determine parking and loading zones. Some blocks may gain parking spaces while others lose a few, Yemen said. But the city expects a net positive in parking along the routes. "I don't have a number yet, but it's looking good," Yemen said. "It's looking positive for the entire corridor." The buffered bike lanes were installed in 2009 after the city removed one lane of traffic on each street. But the lines have faded, making the boundaries between bicyclists and motorists less clear. Wednesday night's forum included eight stations where Center City residents and bicyclists could learn about the various aspects of the project. Once they worked their way through the stations – which each included a poster board and a city official prepared to answer questions – residents and bicyclists could fill out public comment forms. There also was a poster board where residents and bicyclists could post sticky notes listing their concerns. Residents and bicyclists post their concerns to a poster during a public forum on bicycle lane changes in Center City, Wednesday, April 4, 2018. Bill West, 70, of the 1700 block of Lombard Street, uses the bicycle lanes with regularity. He supports the changes, saying it will "substantially improve" safety. But he doesn't think it goes far enough. "I think we need fully-protected bike lanes," West said. "But I'm a realist and I'm willing to take the bite of the apple and wait – but not a whole long time." Some cities have used planters, parked cars and curbs to separate drivers from bicyclists. But West said he'd simply take delineator posts, which Philly officials have used elsewhere in the city. They generally prevent cars from entering bicycle lanes and they're relatively inexpensive. "This is not a wealthy city," West said. "There are better solutions than delineators, but I don't think we can afford them. It's not like we're asking for pie-in-the-sky. ... I just wish we could see a little more momentum on this." Such enhancements could greatly increase the number of bicyclists in the city, said Brent Groce, a 57-year-old who lives along 25th Street, between Spruce and Pine. Groce spent years living in Europe, including Amsterdam, Moscow and Stockholm. Protected bike lanes were a nonissue in those cities, he said. "There was an understanding in Amsterdam that if there's a confrontation, it's the car's fault," Groce said. "You'd see parents with two or three kids on their bikes – and they're not worried. It was a total community scene." Likewise, the Bicycle Coalition of Greater Philadelphia supports the lane realignment plan, but it prefers greater safety enhancements. "We appreciate that this is very specific to intersection changes," spokesman Randy LoBasso said. "Because 61 percent of crashes on Spruce and Pine are happening at the intersection. Obviously, it's really annoying having to drive around cars parked in the bike lane, but at the end of the day, what we really need right now are the intersections being made safe." Executive Director Sarah Clark Stuart said the coalition pushed hard to have the protected intersections included in the repavement plan. She prefers the second and third intersection concepts to the first, which mixes bicyclists and motorists in one turning lane. Concepts "two and three separate the bicyclists and pedestrians ... into lanes and force the turning vehicle to swing out more as they turn," she said. "We think it offers more safety features." A bicyclist rides along the 1300 block of Pine Street as bike advocates create a human-protected lane, Wednesday, April 4. The Center City Residents Association has not taken a position on the issue. A board member collecting community input said she had not received any complaints from residents at the forum Wednesday. Yemen said city officials have received a range of complaints from residents who don't want any changes to others who insist on protected bike lanes. Prior to the forum, a group of bicyclist advocates formed a human bike lane along the 1300 block of Spruce Street. 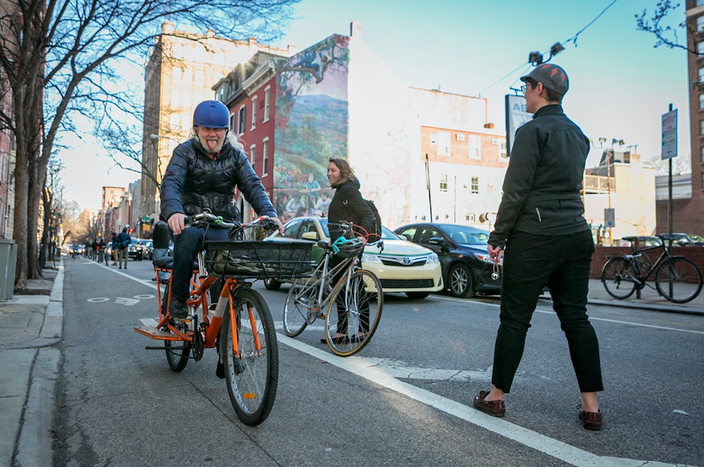 Meagan Cusak, 34, of South Philadelphia, urged city officials to consider the concerns of bicyclists who utilize the lanes equal to the concerns of residents who live along the impacted streets. "For people who are using these as a daily commute ... it seems you're not including everybody who is going to using these thoroughways," Cusak said. 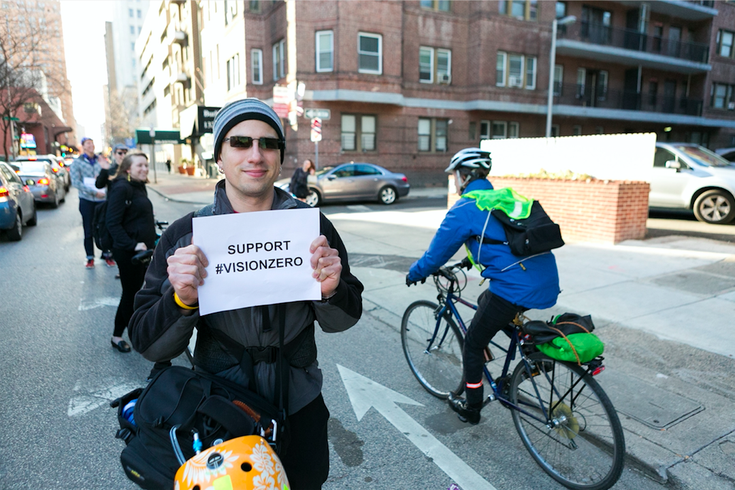 James Kelly, 27, of West Philadelphia, decried the slow pace of bike improvements. "Despite the funding being present, the political will isn't there," Kelly said. "Despite voice support from City Council, the actual changes are not forthcoming."